Let’s face it: we’ve all heard the saying, “No data, no dollars.” Sharing, analyzing, and taking action based on solid data is one of the most important ways to provide transparency and trust with your program’s key stakeholders. But, in the field of parenting and early childhood services, collecting objective and reliable data can be uniquely challenging. Visuals can effectively point out key outcomes and are easier to remember – but only if they are easy to understand. 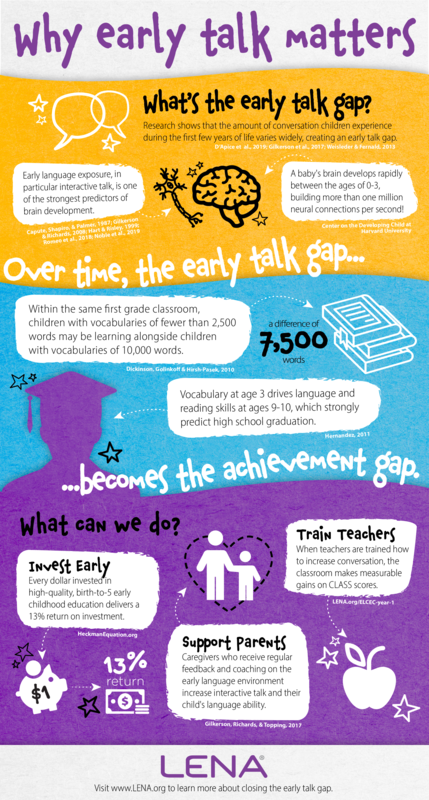 Use infographics to summarize key points, such as this example describing the importance of early talk. Provide context for the data by sharing relevant details to help the audience gain insights that can promote action. Making these important connections clear to stakeholders inspires them to continue program support! In this sample LENA Start data summary, stakeholders can easily see important program success data using numbers and charts along with concise descriptions. By showing and describing accelerated child language development, program stakeholders can directly link early interactive talk to school readiness. Keep it simple and interactive. Focus on your key points – If you overwhelm your audience with too much information, these key points may get lost. Keep it simple, but always have additional information handy to answer any questions that come up.Use links to additional content, interactive charts, and other resources. Let your audience choose their own path through your data based on their roles and interests. For example, if you’d like to offer your stakeholders more information about recent research on the importance of conversational turns, embed links to blog posts, video clips, or webinars on this topic. Perhaps you’re sharing data with a community member who is new to your program. If so, be sure to provide links to help them better understand how your program achieves its goals — like this one on how LENA Start helps parents build confidence! Share your data through stories. Being able to tell a story using your data makes it more valuable and appealing to any audience. Use a short narrative to guide your audience through your key data points – this can be done in a variety of ways, including video presentations.Use quotes and stories from program participants to show impacts at a more personal level. At LENA, we often share personal insights from program implementers and the families they work with. Sharing stories from multiple perspectives also increases the likelihood that each stakeholder will discover a way to connect with your data and will help them understand why your program outcomes matter to them and to your participants. If you’re looking for program support, nothing beats making compelling points about why your program is important to your community! Share how you are going to use your data. Collecting, analyzing, and sharing end-of-program data is important, but how are you using it to determine program refinements that will resonate with funders, stakeholders, or participants? Maximize the usefulness of your data by outlining your next steps. Examples might include changing your program schedule based on participant survey feedback, incorporating ideas for new program incentives, a new plan for recruitment, or even the need to bring in new members to your partnership. Program Fidelity – Implementing a program with fidelity makes it easier to collect and share reliable data. Frequency of Feedback – This matters when it comes to changing adult habits. Regular feedback with families and caregivers, focusing on conversations around key goals and metrics, improves program outcomes. Progress Monitoring – schedule regular data check-ins all along the way with home visitors, coordinators, and coaches. Goal Setting – Encourage parents to set their own goals for improvement. Can they say what they want to focus on? Can they say how/why they will improve? Participant Feedback – Use surveys and face-to-face interactions to connect with the families and caregivers your program serves. This can provide valuable insights for program improvement! A new year is a great time to use your program’s story to spotlight your mission and vision and share ways your data is moving you forward to accomplishing it. Not sure how? Check out this example! At LENA, our programs for families and caregivers provide a unique look into the language environments of young children. The LENA device is the only objective and automated tool that provides individual and aggregate data including adult word counts, conversational turns, and the overall audio environment. Program providers can analyze this data to determine how to best apply research-based practices and build capacity among participants – the parents and caregivers working with young children. When combined with child language development data, LENA’s programs provide the necessary metrics for program evaluation and refinement. Interested in learning more about how LENA’s data-rich programs could help you connect with your key stakeholders? Check out one of our short, informative on-demand webinars. Laura Camp is a Business Development Manager at LENA. She brings over 25 years of experience in early childhood education, including classroom teaching, instructional coaching, and administration of multiple early childhood programs.